Three generations of the Brown women travel west together on the Oregon Trail, but each seeks something different. When the trail divides, a decision must be made that could bring survival or tragedy. The challenges faced will form the character of one woman--and impact the future for many more. Drama, adventure, and family struggles abound as three generations head west on the Oregon Trail When Tabitha Brown's son makes the fateful decision to leave Missouri and strike out for Oregon, she refuses to be left behind. Despite her son's concerns, Tabitha hires her own wagon to join the party. Along with her reluctant daughter and her ever-hopeful granddaughter, the intrepid Tabitha has her misgivings. But family ties are stronger than fear. The trials they face along the way will severely test Tabitha's faith, courage, and ability to hope. With her family's survival on the line, she must make the ultimate sacrifice, plunging deeper into the wilderness to seek aid. What she couldn't know was how this frightening journey would impact how she understood her own life--and the greater part she had to play in history. 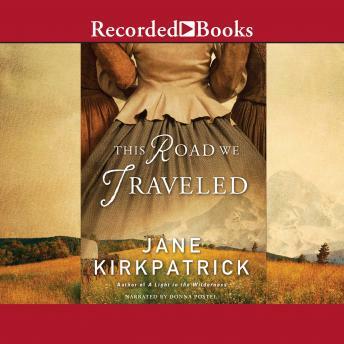 With her signature attention to detail and epic style, New York Times bestselling author Jane Kirkpatrick invites readers to travel the deadly and enticing Oregon Trail. Based on actual events, This Road We Traveled will inspire the pioneer in all of us.